Priene, now known as Güllübahçe, was an ancient city of Ionia in Western Anatolia situated some 20 km from Söke. Excavations here were begun by Carl Human in 1895 and completed by Th. Wiegand in 1898. The ruins of Priene present one of the most striking examples of the grid type of town-planning associated with the name of Hippodamos. The plan of Priene was based on that of Athens and, as the ancient town is located on a slope at the foot of a great cliff of rock, the grid plan is displayed in all its magnificence. Temples and other buildings were constructed on terraces in front of the cliff. No one who visits this little city can fail to be impressed by the landscape and the whole surrounding atmosphere. In spring it fills anyone who views it with the joy of life. T he origin of Priene and the foundation of the city are ascribed to the Carians, the indigenous population of the region, but legends are our only guide for the earliest days. The oldest remains have been dated to the 6th century B.C., and it was on the territory of Priene that the site of the Panionion was located. According to some sources, the Ionians first arrived and settled here in the 11th century B.C. and the city was founded either by Aegyptus of Athens or Philotas of Thebes. The city was one of the most influential cities of the Ionian Confederacy and took part in the development of holidays and festivals in honor of Poseidon Heliconios. Bias, one of the most eminent thinkers of ancient times lived here. An electrum coinage is known to have been produced during this period. In the 7th century Priene came under Lydian rule and in the 6th century it was conquered by the Persians, who were to exercise hegemony for over a century. Priene . contributed twelve ships to the rising against the Persians. A naval battle took place off Lade in 494 B.C., with 353 Ionian triremes (ships propelled by galley-slaves at three banks of oars) against 600 Persian sailing-ships and Darius took his revenge by completely destroying the city. The city possessed two harbours, but both of these became silted up by the alluvium brought down by the Meander river. The new city was built on its present site in 350 B.C. At that time the city lay at some distance from the sea and carried on its maritime activity through the little port of Naulochus. Like the contemporary city of Pergamon, it possessed a very fine urban layout and a magnificent view. Priene was noted for its peace and prosperity, and never displayed the pride and arrogance of Ephesus. It remained a lovely little city with a population of 4,000. The marble and bronze statues that adorned the streets were painted in red and blue. It was attached to Athens and never played a truly independent role in politics. In the 4th century B.C. Alexander the Great dedicated a temple to Athena here. The city was occupied by the Gauls in 277 B.C., then, after after passing for a time into the hands of the Seleucides, it was incorporated by King Attalos into the Kingdom of Pergamon. In 129 B.C. Priene became part of the Roman province of Asia Minor. It was sacked by Mithridates, King of Pontus, in 88 and 84 B.C., but regained its former wealth and prosperity under the Emperor Augustus, whose cult was performed in the temple of Athena and the Sacred Stoa. After this, the increasing distance from the sea led to the decline of the city. Priene was the birthplace of Bias, one of the seven sages of antiquity. When Priene was besieged by the Persians and the citizens began to flee from the city taking all their valuable possessions with them, Bias remained unmoved. On being asked if he had no possessions he wished to save from the enemy, he replied, "All my wealth is in my head" . Other famous pronouncements of his are "Not to be able to participate in misfortune is the greatest catastrophe." "Begin slowly but continue with vigour." "Action makes the man." Priene was also the birthplace of Archelaus, the famous sculptor who, in the 3rd century B.C., adorned the city with his artistic creations and went on to work in Pergamon towards 240 B.C. 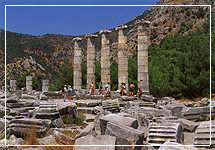 Priene appeared once again on the stage of history in the Byzantine period as the seat of a bishop. It was captured by the Turks in the l4th century, after which it continued its existence as an insignificant village.